This medium-capacity batch freezer produces the highest quality ice cream, gelato, sorbet, italian ice or sherbets. 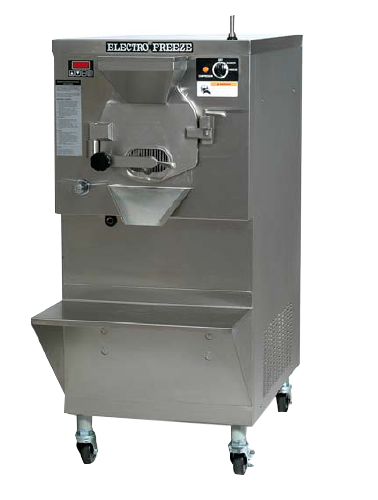 Mechanically simple and exceptionally dependable, this machine is perfect for gelato, custard and water ice shops. with audible alarm plus adjustable torque control. This high-capacity bath freezer is simple and efficient, making it perfect for gelato, custard and water ice shops. Make large volumes of your own signature Gelato, Italian Ice, Sorbets and hig or low over-run ice cream. for automatic operation and shutdown. Backed by a world-wide distributor network. This high volume, front-loading freezer with refrigerated cabinet was designed for high-traffice specialty ice cream and custard stores. serves a variety of frozen products, custard, ice cream sorbets, water ice or yogurt. Gently blends, reducing agitation, maintaining product quality and consistency.